The R2G2® mouse is an ultra-immunodeficient model which is a double knockout for the recombination-activating gene 2 (Rag2) and the IL2rg (common gamma chain) gene. Envigo acquired this model in 2016 from the Fox Chase Cancer Center (Philadelphia, PA). The combination of Rag2 and IL2rg mutations results in an absence of various cytokines including IL-2, IL-4, IL-7, IL-9 and IL-15. It also lacks B cells, T cells and NK cells and has deficits in dendritic cells and macrophages compared to NSG™ mice. The R2G2® model also features a reduced radiosensitivity compared to NSG™ mice, which is advantageous in studies requiring radiation. Moreover, the R2G2® mouse has exhibited significant tolerability towards standard of care chemotherapy drugs, along with tolerability towards estrogen treatment. Here, we’ll explore the results of these two recent studies, particularly with regard to body weight and overall survival. Chemotherapy side effects may lead to safety issues and can impact the preclinical study itself. For example, high rates of morbidity can prevent successful completion of the study. Preclinical studies should predict both the efficacy, such as the reduction of the tumor mass, and evaluate the safety, for example, by monitoring the toxicity of the therapy. Given that studies often compare a new therapy with an existing therapy, it’s important to know how an animal model tolerates standard of care chemotherapies. In a recent study, R2G2® mice were treated with typical experimental levels of either 5-fluorouracil (5-FU), doxorubicin (Dox) or cyclophosphamide (CTX). Overall, no significant changes were observed with regard to clinical chemistry or hematology responses. However, treatment with 30 mg/kg 5-FU showed a statistically significant reduced number of red cells, increased mean corpuscular volume and increased mean corpuscular hemoglobin. The three standard of care chemotherapy drugs cited above were well-tolerated in R2G2® mice at the lower doses, in terms of overall survival. CTX was well-tolerated at all doses tested. Higher doses of 5-FU and Dox caused increased toxicity as indicated by decreased survival. The body weight results were consistent with the results seen in overall survival. Only the R2G2® mice treated with Dox at 5 mg/kg exhibited significant loss of weight. 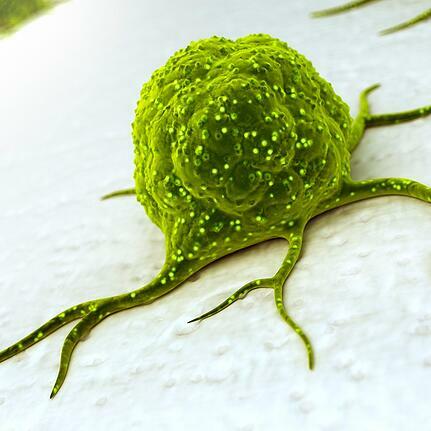 Growth of some xenograft tumors such as estrogen receptor positive cancers, requires supplemental estrogen. In other immunodeficient models, higher doses of estrogen often result in adverse effects including weight loss and bladder stones. In a recent study, R2G2® mice were implanted with 60-day release estrogen pellets at doses between 0.18 mg and 1.7 mg. Overall survival was monitored for up to sixty days and body weight was regularly monitored. Overall, no significant changes were seen in terms of hematology or clinical chemistry. The only exceptions to this were 1) elevations of white cells (statistically significant only at 0.18 mg estrogen), 2) elevation in monocytes (significant at 0.72 mg estrogen), and 3) estrogen-dose dependent increases in alkaline phosphatase and decreases in cholesterol. Survival generally decreased proportionately with increasing doses of estrogen. Generally speaking, animals treated with the lower doses of estrogen survived longer and at a greater percentage at the end of the study. Throughout the sixty days of the study, body weights remained stable with no observed weight gain in the estrogen treated animals versus the control animals. Overall, the lack of severe morbidity and stable weight over the course of the study suggests that the R2G2® model would serve estrogen-dependent tumor studies well. For more detailed information, please review our white paper about the recent studies involving the R2G2® model. If you’d like to review our hematology and clinical chemistry results for our R2G2 studies or consult with our experts about your upcoming study needs, please contact us.